Simply lift guard rail to enter loading platform. Place load on platform and lower guard rail after exiting platform. Opposite side is now open for fork lift to pick up load. Reduces accidental falls when loading and unloading to mezzanines, elevated levels and raised platforms. 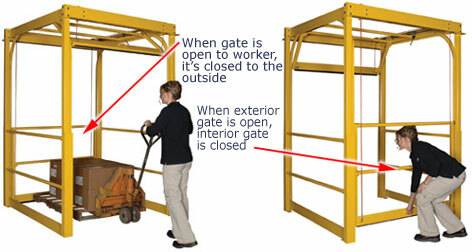 Protects workers below platform by preventing objects from falling off edges - gate on open edge is always closed when accessed from platform. Sturdy steel construction for durability and long service life.